As acting global head of marketing, sales and customer service, Doug Speck's ultimate goal will be to make sure Volvo meets its target to more than double worldwide sales to 800,000 units by 2020. After spending $1.7 billion last year to acquire Volvo from Ford Motor Co., the Chinese automaker Zhejiang Geely Holding Group now plans to spend as much as $11 billion on Volvo products and facilities over the next five years. A growth strategy for the United States will be completed by the end of next month. Doug Speck, CEO of Volvo Cars of North America, says the plan will call for new vehicles and perhaps a U.S. plant eventually. Speck, 52, was named acting senior vice president for marketing, sales and customer service at Volvo's headquarters in Sweden, effective June 1. 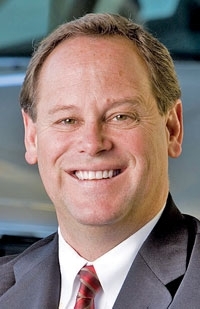 He was interviewed by Diana T. Kurylko a staff reporter at Automotive News Europe sister publication Automotive News at Volvo's U.S. headquarters in Rockleigh, New Jersey, prior to the reassignment. Q: How many vehicles will you sell in 2011 in the United States? A: 60,000 to 70,000 cars. Last year we sold about 54,500. There is some uncertainty out there related to what the effect of the Japanese disaster will be in terms of production. Do you source much from Japan? We have some sourcing from there -- electronics. It could affect our production. Most everyone in the automobile business is, but it is not clear how and, if so, how much. What will drive your increase in 2011 sales? Predominantly S60 sales. We sold slightly over 2,000 S60s last year because we stopped building it while we were changing over the plant. We could easily see ourselves selling 15,000 to 20,000 S60s this year -- a huge increment year-on-year from that car line. Are you attracting conquests or is this pent-up Volvo owner demand? Right now 45 percent of the volume is from Volvo owners; obviously, the other 55 percent is from other brands. The brands we see run the gamut -- about 20 to 25 percent are other luxury marques, and the other 20 to 25 percent are mass brand move-ups from Toyota, Honda, Ford. Earlier this year, Volvo Car Corp. CEO Stefan Jacoby announced plans that include more than doubling U.S. sales to 120,000 units by 2020. How will you achieve that goal? A lot of that depends on what will happen with the industry so it is difficult to be precise. If the industry grows as we expect it to, that is not an unrealistic goal for our business. The cornerstone of our business will be the two "60s" near term, the S60 and the XC60. Over the mid-term XC90 will clearly be a product we will count on for some volume. Were your product plans put on hold during the process of Ford's selling Volvo? During the sale, the product plan did not change at all. Ford was out speaking to potential buyers and had a vision for the business for the future and that was a component of why Volvo had value. It was important while they were in the process not to have change in that regard. How do you define your product strategy? Most of the brands we compete with have two to three cars that do the bulk of sales, and then they have niche products. We are approaching it the same way if we can do a good job with the two 60s and XC90. Both are brand new or fairly new, and we have a plan to refresh and bring an all-new XC90 to the market. We will be competitive in key volume segments. Our aspiration is to be a luxury brand competitor. Even with S60 and the XC range, we see cross-shopping with BMW, Audi and Mercedes. We are on the shopping list for folks looking at other luxury marques. Does this mean Volvo will be rolling out derivatives of the S60 sedan and other models as niche products? My personal philosophy is you have to be very good first with the core products ... with competitive cadence for refresh and all-new before you start to debate if you have niche products off the core products. In the short to medium term, that is where Volvo's focus will be. And we will be very competitive with powertrain and refreshing. After we have secured that position, then we can worry about niche products. How long will it take for you to become a significant player in the compact luxury segment with the S60? The foundation of this business needs to be S60. The car we have introduced right now is very competitive, whether you talk design, craftsmanship, technology or performance. We see that in the results that show up every month. We actually have a very good base plan for S60, a solid refresh activity in the right time frame. The average refresh is in three to four years and the all-new in six to seven years, and we need to compete in those time frames. The S60 base plan does that. How have things changed since Geely acquired Volvo? Most dramatically to me, there is a lot of energy behind a 10-year plan. We all need to understand what we are doing with the brand and what activities it will take to deliver the brand aspirations that we have -- the volume aspirations we have, the profit aspirations we have -- and we all need to be heading in the same direction. You're strong in the Northeast and in places such as Colorado. Where is the potential for growth? Clearly we have to improve our market share in the Sun Belt. Products like S60 and XC60 are the foundation off of which we will do that. If you look at segment dynamics, the Sun Belt is much larger in the sedan business and in the luxury business than crossovers. Where we are historically strong is the wagon and crossover world and, as a result, in places where those segments are largest we have good market share. Where we have to be much better is the sedan side, and by doing so we will improve in the Sun Belt. We have great growth in Miami and Los Angeles -- all on the back of S60 and XC60. How goes Safe + Secure, your free scheduled maintenance program? Is it bringing in new buyers? If the dealer feedback I get is any indication, then the message is yes. One, it helps us maintain a good balance between buy and lease. Someone who buys their car attaches more value to a 5-year/60,000 mile coverage warranty versus someone that leases. Two, it clearly is an attribute that distinguishes us from other luxury marques, and it helps people at our dealerships with their conversion rates. It is a great closing tool. It definitely improves customer satisfaction. And the most recent J.D. Power CSI survey is an example. People who responded to the survey who have Safe + Secure coverage -- on average their score was 50 points higher than folks who have older cars without Safe + Secure. And it is a great tool to continue to wed the customer to our service shops, which is important not only for dealer profitability but also for loyalty. You launched a dealer-consolidation program a few years ago and have had key projects in cities such as Dallas. What more do you need to do, and how much more do you need to consolidate? We went from 365 to 315 dealers in the country over a 24-month period. The bulk of it was done in 2008 and 2009. I said before that if the opportunity presented itself we could be a brand that has about 300 outlets. We are not actively pursuing consolidation right now, but we will look for consolidation in an opportunistic fashion, when it makes sense. We will migrate away from consolidation as a core component of our network strategy toward consistency of improvement of the ownership experience. Correlated to this is the 10-year strategic review that is under way and will result in significant investments in America to grow our business and improve our brand. Over time, we would expect investments to improve the ownership experience on the network side. We need to show dealers we are committed through consistency of marketing dollars, competitiveness and with products. Having delivered that consistency of commitment for a certain period of time, we will have earned the right to come out to dealers and say now we need you to make strategic investments as well. Facility improvements, personnel as it relates to training, etc. -- all the things that result in the customer saying: "I really enjoyed that purchase or service experience." Do you need to do a facility-improvement program? It is not something we will do this year. We are out there working with dealers. Some raise their hand and say, "I want to make an investment; it's time." As we leave this year and go into subsequent years, we will put emphasis on that project.